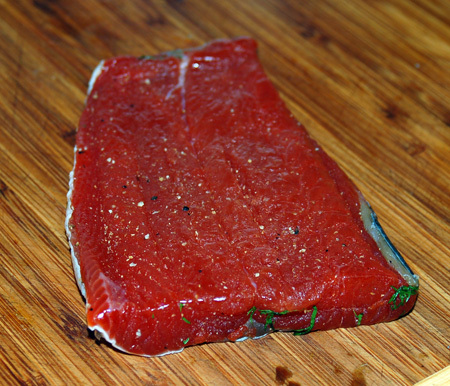 All summer long, every time we brought home a huge, deeply red wild salmon fillet from the store, I made a little mental note to save a piece of it to try making into gravlax, a Scandinavian version of lox, or cured salmon. How I came across this idea, I’m still not sure, because I’ve never even tried smoked salmon; and then I proceeded to cook all of it anyway, probably due to some niggling anxiety whether the finished product would even be edible. This time, the purchase of a wild sockeye fillet coincided with a fresh bunch of dill in the crisper, and I was finally determined to give home-cured salmon a try. It was just a few moments’ work to mix up brown sugar, salt and a bit of ground coriander, pack it on both sides of the salmon with a mound of chopped fresh dill, and wrap it firmly in plastic wrap. I opted to store my curing salmon in a heavy ziploc bag set inside a loaf pan just to make sure any leakage was contained. I flipped the salmon every time it crossed my mind, several times a day, and by the third day, the brown sugar mixture had mysteriously vanished, a considerable amount of liquid had leached out of the fish (none of which escaped the bag, fortunately) and the flesh felt very firm under its coating of wilted herbs. With considerable trepidation, I unwrapped the salmon, poured off the liquid, and scraped away the dill, revealing a darkened and rather withered-looking piece of fish that I thought might have become over-cured. Despite my better judgment, I sliced into the salmon on a bias into the thinnest possible slivers, noting that it wasn’t quite so dry and tough as it had at first appeared. I dared to sample a bit no larger than the tip of my pinky finger, and was very pleasantly surprised by a buttery texture and rich, salty flavor perfumed with dill. It was so good that I immediately started casting about for ways to use it, other than nibbling slices right off the board. My first thought, of course, was to serve it on bagels (this was the reason I baked those sourdough bagels, incidentally), but we had no cream cheese and I didn’t feel like waiting for yogurt to drain. 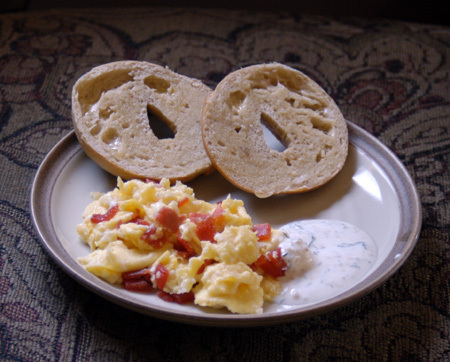 Instead, I folded bits of the gravlax into softly scrambled eggs, served with a toasted bagel and a dollop of yogurt shot through with dill and garlic. The salty gravlax seasoned the eggs and filled a roll very similar to bacon; I liked it much better than the scrambles I have made with leftover cooked salmon, whose moisture always seems to affect the texture of the eggs negatively. I also loved the garlicky yogurt with it, much more than Jeremy did, I daresay. 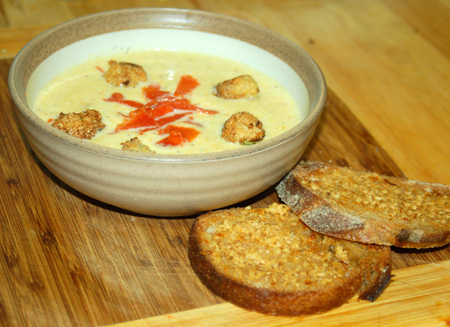 A few days later, after stocking up on fresh vegetables at the farmer’s market and scoring three ears of fantastic corn for a dollar, I made a pot of corn soup for dinner. Despite the sweetness of the corn and simmering the cobs in milk and broth, I didn’t find the finished soup particularly impressive, so I loaded it up with flavorful garnishes: sourdough garlic toast, fried okra croutons, and some slivered gravlax right in the center for seasoning and a colorful contrast. The combination put the meal over the top, and we scraped our bowls clean, hiding out in our air-conditioned bedroom against the heat. 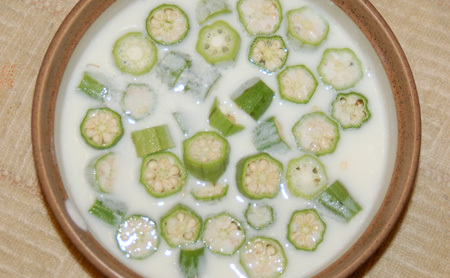 I should also note that the okra, remarkably enough, came from the farmer’s market; I’d never seen it fresh before, even at the grocery store, and had never tasted it before either. This was baby okra, mostly 2″ or less, which apparently has fewer issues with sliminess than the more mature pods. I soaked it in buttermilk and fried it in a basic coating of flour and cornmeal to further combat the textural issues, which made this picky eater decidedly anxious. The resulting “croutons” were super-crunchy and not slimy at all; in fact, I had a hard time distinguishing the okra’s flavor at all, other than a mild bitterness that played off the sweet corn and salty gravlax. All in all, this was a very good week for overcoming food fears! Combine the sea salt, brown sugar, coriander, and a few grinds of pepper; pack firmly onto both sides of the salmon fillet. 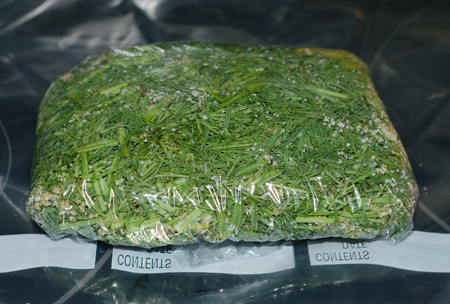 Sprinkle half the chopped dill onto a sheet of plastic wrap then set the salmon on top of it, and cover with the remaining dill. 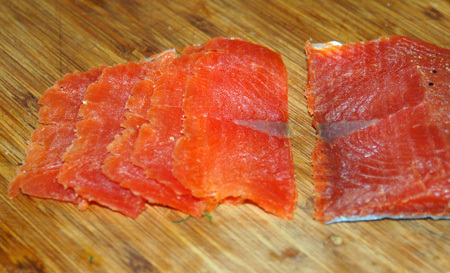 Tightly wrap the salmon fillet and place in a ziploc bag or baking dish. Place in the fridge for three days, turning several times a day. When the fish has darkened somewhat and feels firm, unwrap, scrape off the dill, and slice very thinly on the bias to serve.